Welcome to the home of the Northern Army of the East Kingdom of the SCA! Q- "What is the Northern Army?" 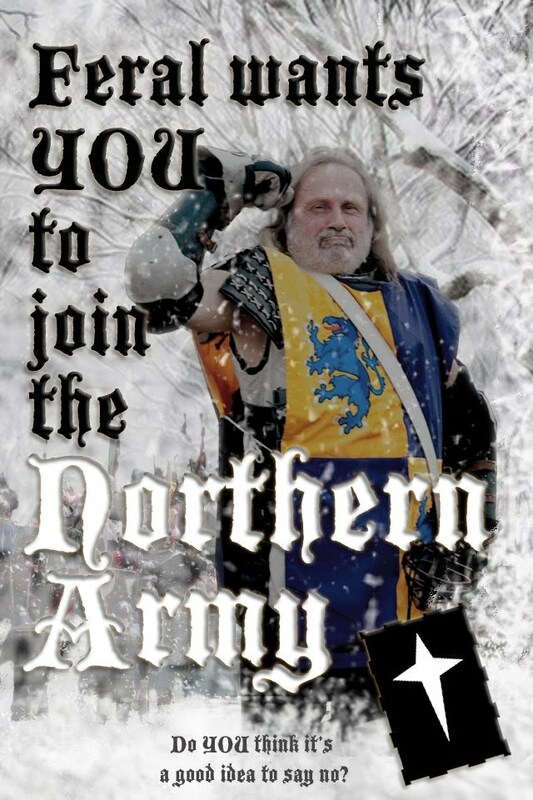 A - "The Northern Army is a confederation of individuals and households that hold an affinity for each other and a desire to rally under the household banner of the Northern Army. By belonging to the Northern Army, it is understood that you hold as sacred the dedication to training the troops, regardless of affiliation within the kingdom of the East, but especially within the Northern and Central Regions." Q - "What is the SCA?" "Moreover, in the whole force there could be found. No serf, no freedman, none of ignoble, none weak with old age. All were nobles, all vigorous with the strength of complete manhood, fit for all manner of battle, and so swift on foot that they despised the fleetness of calvary." - encomium emmae, ii., C.4. This is NOT an officially recognized Web Page of the Society for Creative Anachronism, Inc. (SCA). The maintainer of this page is Lord Richard le Hauke. It is not a corporate publication of the Society for Creative Anachronism, Inc. and does not delineate SCA policies. In cases of conflict with printed versions of material presented on this page or its links, the dispute will be decided in favor of the printed version.